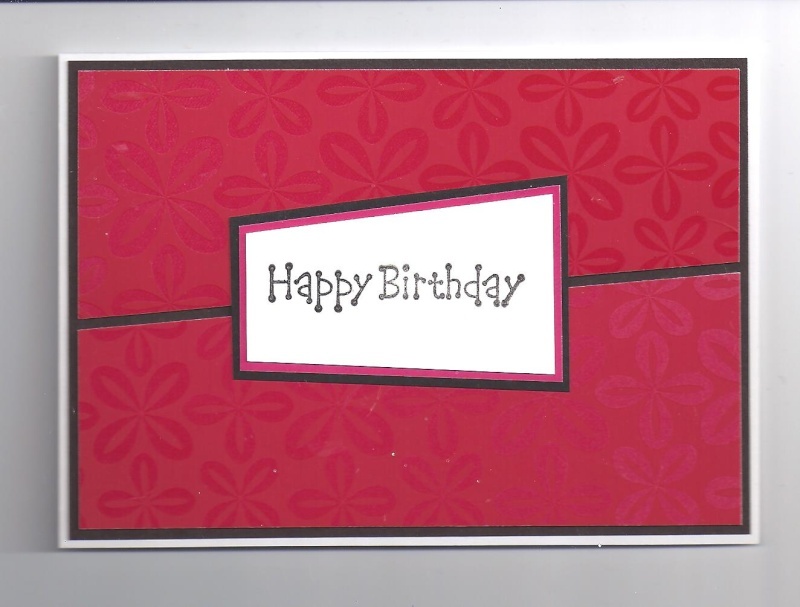 Everything recycled, except the card blank and the double-sided tape I used! The self-patterned background (glossy on matt) was the sides from a box of chocolates: box was shaped like a Roses box (narrower at the bottom) so that gave me the idea for the background. Not sure if it needs something else, though. That's perfect for a mans card, strong colours and not fussy. Good design. Lovely card and great that it is recycled bits. Great as it is for a man, if you wanted you could put a coordinating bow or a gem on for a lady, but it's fine as it is. I'm the same, can't do clean and simple. I like it as it is! Pink not really suitable for a man, I'm afraid - Steve said the same, though! Doesn't look that pink in the photo, more red with bit of pink around the message. Couple of gems then to bling it up a bit for a ladys card. Definitely pink, and the design in the background is a bit flowery. I thought of gems too, Di: planned as a female card, so think that's what I'll do. yes if its pink , it def looks red, then a gem or two in a corner will finish it off . well done on all being recycling , it just shows you what we normally throw in thebin...imguilty of it . That's how I started, with recycled stuff: once you start saving things, you can't stop! I like that , some gems in the flower centres maybe.